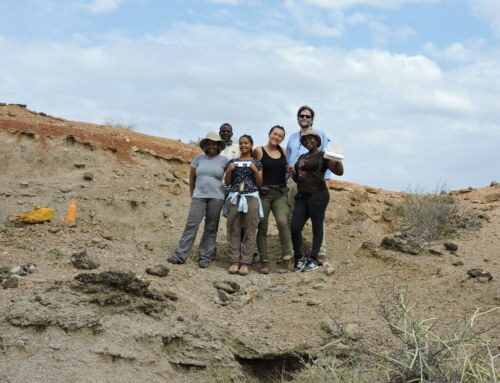 The students started off the Archaeology module with Dr. Elisabeth Hildebrand in Lodwar; the biggest town in the northwestern part of Kenya. Accompanied by Justus Erus Edung, who works with the National Museums of Kenya and has extensive knowledge about Lodwar, the students were escorted to three cultural and historical sites within Lodwar. Justus explained to the students the importance of each site and each one’s significant role within Kenya’s history. The first of the three was the Kenyatta House, a prison the British colonial regime created for Jomo Kenyatta, an independence leader who later became the first president of Kenya. Two years of his sentence were spent here for resisting colonial rule back in the 1950’s. The second is known as the River House, constructed during the 1960’s shortly after independence; unfortunately not much is known about the use of this site. The final location is known as the Tribal Courts, positioned at the highest point in Lodwar, now surrounded by official buildings. This structure was used as a court house by the local community during the 1940’s. 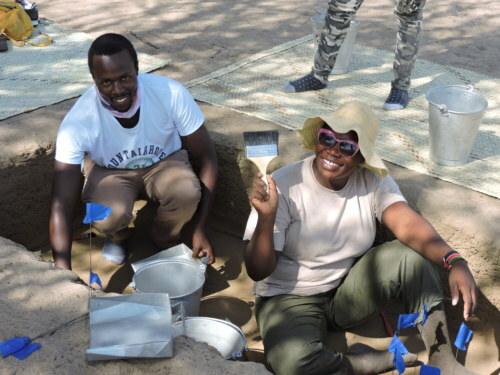 The rest of the week consisted of excavating at Nakwaperit 2, an archaeological site under research by the Later Prehistory of West Turkana (LPWT) team, led by Dr. Hildebrand. This site is thought to have been used by early pastoralists (or herders) in the area. 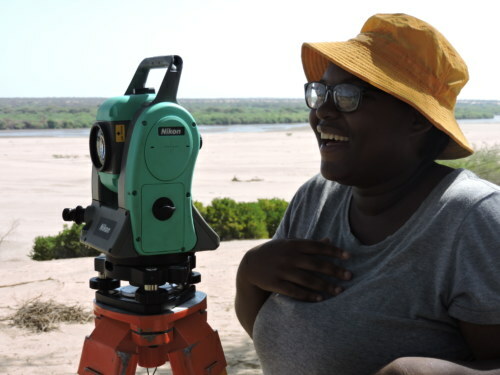 LPWT has recently published exciting results from a mortuary site built by early pastoralists at Lothagam North, 40 km southeast. By working at Nakwaperit, we hope to discover the day-to-day lives of the people who built the large communal cemetery at Lothagam North. The students learned what the life of an archaeologist was all about; including how to un-backfill a unit, how to set up and use a total station for precise spatial control of all units and artfact finds, how to properly fill out the various excavation forms documenting changes in sediment, how to bag and catalogue important finds within a unit, and how to compare sequences of deposits from different excavation units around the site. They were taught the importance of teamwork when in the field and how to overcome the challenges that are faced during an excavation. 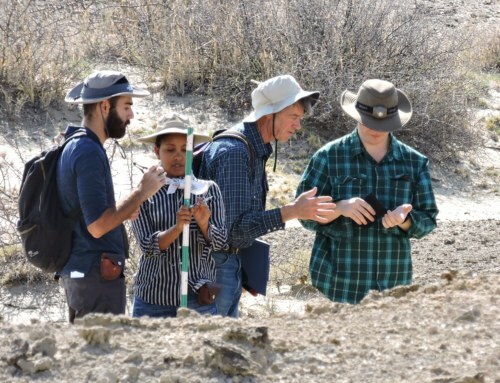 The students spent 4 days in the field, digging and learning the essentials of working on an excavation. 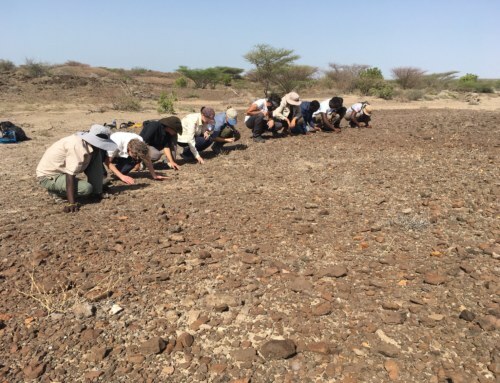 Taking turns in the Turkana sun, they spent ample time in each unit, digging each level at 5cm increments with buckets, trowels, and brushes. They learned the amount of time and patience it takes to do this kind of work in order to ensure no damage came to any artifacts or remains that may be lying in wait under the surfaces that they were working on. They conquered every task that was thrown at them, and every obstacle that they encountered was navigated with ease. The last day of excavations consisted of finishing up the levels that they were working on and profiling each unit. Profiling the walls of a unit is done by making a two dimensional drawing using a scale and plotting points of the stratigraphic changes within the unit. 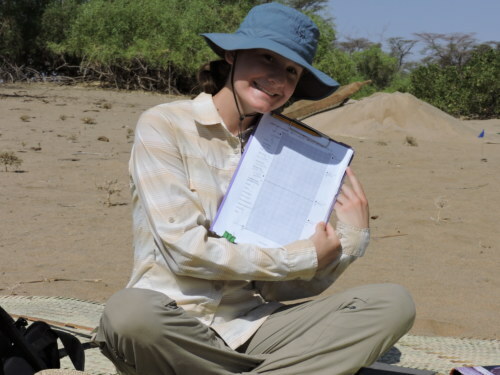 This detailed documentation is important because it allows an archaeologist to understand and see where significant changes occur between layers, which can be correlated with other units within the area to create parallels within the excavation area. Once that was finished the students backfilled the units, so that they don’t erode and restored the area to its original appearance. 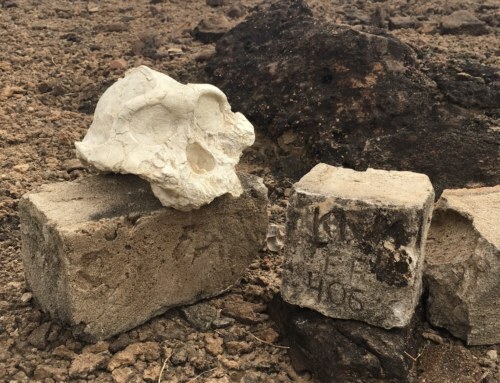 Among the artifacts that the students collected and recorded were pieces of pottery, stone tools, bone fragments, charcoal, and ostrich egg shell. 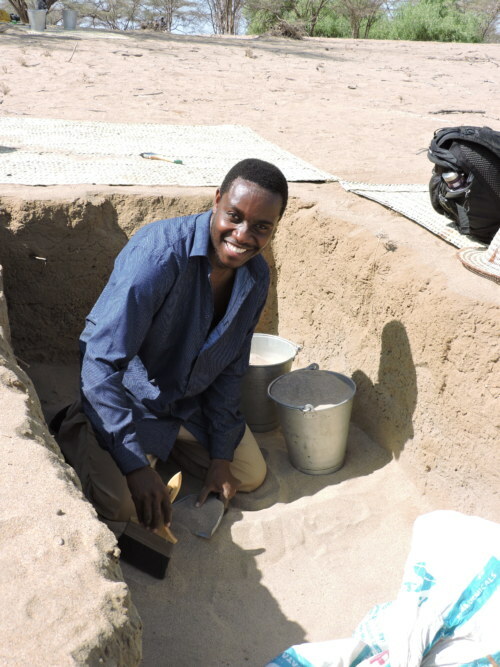 These finds will help the team to better understand the people that were living in this area ~4000 years ago and how they were using their environment. 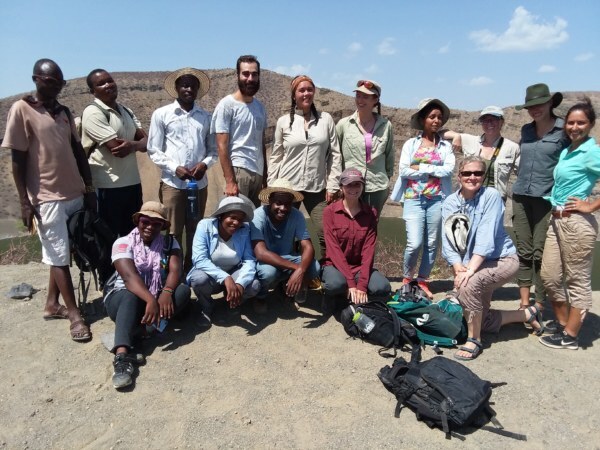 On their day off the students took a trip to Central Island; located in the center of Lake Turkana and home to the largest population of Nile crocodiles in Kenya. It is a national park that contains three small lakes within the craters formed by the volcanic island. 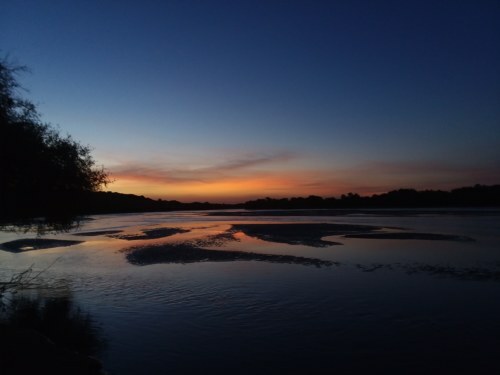 First they visited Crocodile Lake, where they were able to hike up an outcrop that overlooked the lake, and from there they were able to see a few of the crocodiles in the lake below. 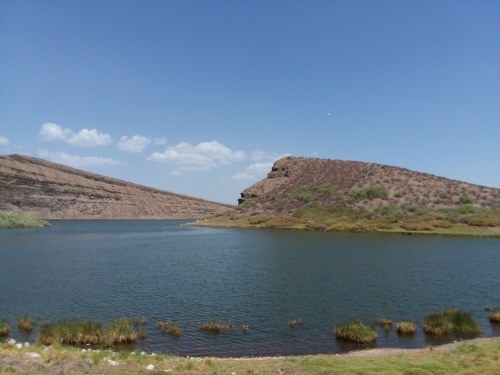 They continued their trip by venturing to the East side of the island and hiking up the side of a dormant volcano to see Flamingo Lake, which historically has had many flamingos present. Sadly we didn’t see any flamingos this time but the jaw-dropping views of the crater lake and Lake Turkana beyond were worth the hike. 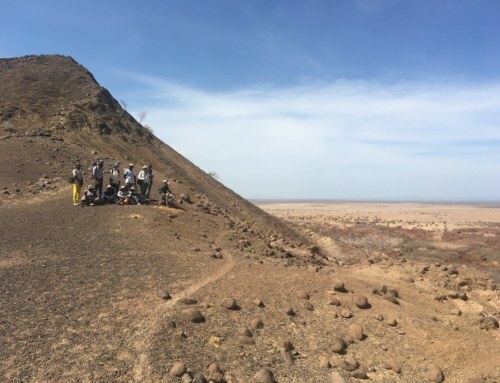 After taking in the beauty of the island the students started their journey back to Turkwel.